Preheat the oven to 350 degrees. Grease two 7-inch cake pans, line the bottoms with waxed paper and grease the paper. Whisk all the cake ingredients together until smooth and creamy. Divide the mixture between the cake pans and smooth the surfaces. 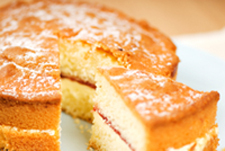 Bake for 25 to 30 minutes or until a cake tester inserted in the middle of the cakes comes out clean. Turn out onto a wire rack, peel off the paper, and let cool. Place one of the cake layers on a serving plate and spread with the raspberry jam. Place the other cake on top. Dust the top of the cake with the confectioner’s sugar.